You will not need to buy Ziploc bags more often than once every ten years. In fact, Smug Scout does not even remember how many years ago she bought that box of Ziploc bags. She also still has every one she ever got from a friend, though her friends may no longer recognize them in their current form. She will not ask them to try. You will need to continue to buy expensive and limited production local wine, so that you will have sufficiently Smug wine bottle Ziploc drying poles. 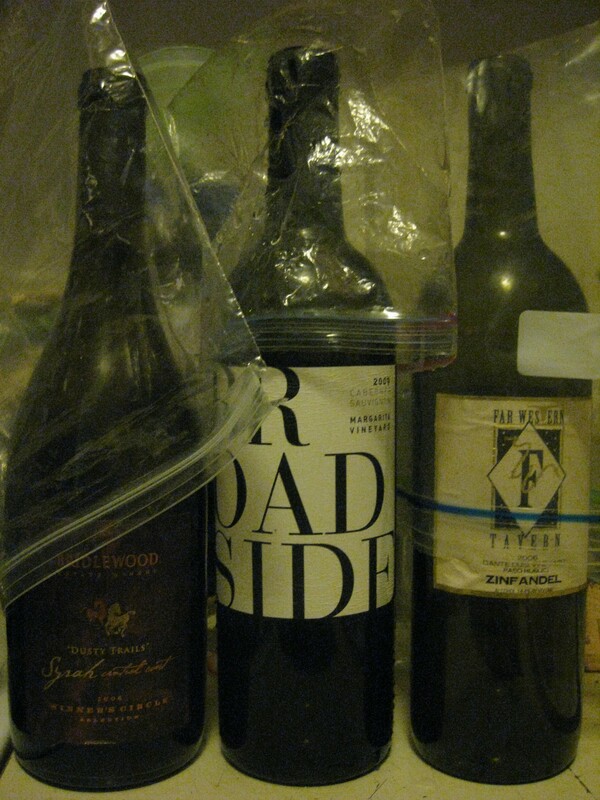 You do not want a wine bottle Ziploc drying pole made from cheap swill of suspect provenance, like any house label of a certain eco-hostile supermarket chain (all that plastic!) known for its $2 wine, which Smug Scout considers unfit for human consumption. Flagrant wastrel: Those bags are disgusting! What are you, some relic from the Depression? Smug Scout: Maybe so. What is the last bottle of wine you bought? Flagrant wastrel: I got a great deal on a French red from Trader Joe’s. It only cost $4.99. Smug Scout: I see. You have vulgar taste and clearly no gag reflex. I would only drink that plonk through an IV line. Flagrant wastrel: You’ve just insulted me! Smug Scout: True, but I hope I insulted Trader Joe’s more. Just ask Smug Scout if you need a bottle or two for your Smug wine bottle Ziploc drying poles. She will not share her Ziplocs, however. You will have to age those on your own. Final warning: be proud of your Smug wine bottle Ziploc drying pole. Try not to let Smug friends bamboozle you into squandering $20 on a reclaimed wood plastic bag dryer from Vermont, even though this is clearly a very Smug object. Smug Scout in fact just found herself out-Smugged by a very Smug friend in Portsmouth who first took pictures of her reclaimed wood plastic bag dryer, pictures that featured Smug iconography such as MacBooks, hand varnished reclaimed wood tables, and an “earth-sensitive” pinot noir (a bottle that still had wine in it, pointedly not to be used as a wine bottle Ziploc drying pole), only to brag that she could not take a picture of this contraption “in use” because she simply “doesn’t use much plastic.” Wow! Out-Smugged on two counts! Now Smug Scout knows when she is down for the count, but she would like to point out that it is much more sensible to spend that $20 on a bottle of wine than an object you then become too Smug to use. I’m so relieved to know that I’m not the only one doing this. Smug Scout thinks you must also be quite ingenious, slackerPTAmom! Would you take a picture of it? Hi Mary! Smug Scout just loves the idea of using pants hangers with clips! How clever. It sounds like you are a fine tribute to your mother. Smug Scout herself hopes that her grandmother, who was a teenager during the Depression, would be proud of her. I came across an equally fantastic use for pants hangers —–use them to clip your recipe open (whether a book or a mag, or whatever) and hang them from the upper cabinet pull. I mean….how smug is that!! That is highly Smug and resourceful. Smug Scout wonders how many other Smug uses of hangers may exist. Please continue to craft other uses and share them. You sound rather like a Smug scout.